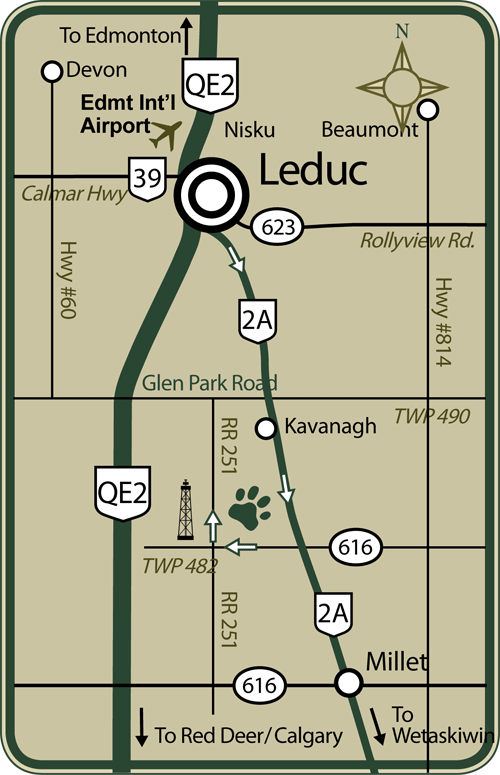 Head south on QE2 through to the south end of Leduc. Exit onto Hwy 2A to Wetaskiwin and proceed south for approx. 15km (10 min) to TWP 482 (also marked as Junction 616). Turn right (west) onto TWP 482 for 2.5 km (gravel) to Range Road 251 (first crossroad). tower (visible from Hwy 2A). Heading north on QE2 take exit to #497 Millet (Hwy 616 E) and go right (east) for approx. 5 min. to Range Road 251. Turn left (north) and follow 251 for approx. 5 km (gravel) to TWP 482. Proceed across TWP 482 to the first driveway on the right - across from large communications tower. Turn left (west) onto TWP 482 for 2.5 km (gravel) to Range Road 251 (first crossroad). tower (visable from Hwy 2A).